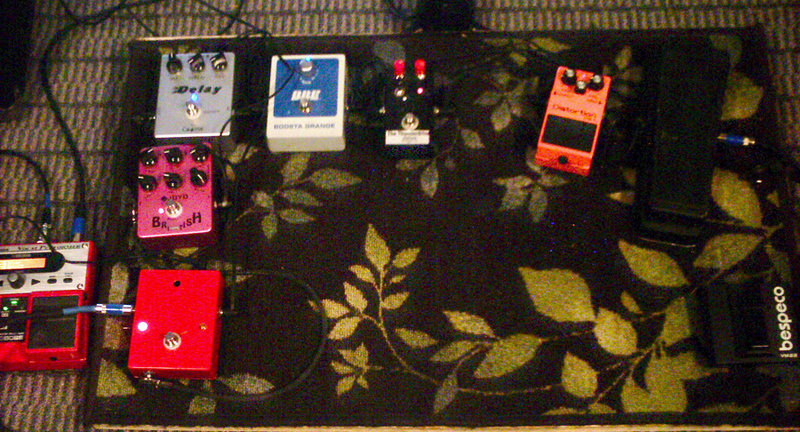 Today’s pedal line is from Bruce Lyons. If you have a pedal line (doesn’t have to be in a board) for your rig, please email me a photo, bio, description of pedals and routing to pedalline@nulleffectsbay.com. Every Friday I’ll showcase a pedal line submission. Make sure you include any links to your band or music page. A Jim Dunlop Crybaby, to which I added a 3PDT switch to get a pure bypass, plus I added an LED light. A Joyo JF-16 distortion pedal for a different kind of distortion effect. An A/B switch box I made form a kit for a different pedal which did not work correctly. I use that switch mainly as a kill switch. I also plug a tuner into the “B” side. I also have on the lower right a Bespeco amp switch. Sometimes I use a Fender Ultra Chorus, and I use that switch to change channels on the amp. It’s not at all anything fantastic, it’s just what I have, and it works for me. I love the Thunderdrive Deluxe! I bought myself one for Christmas last year – it was fun to build my first pedal! I left the sticker off mine (makes it more mysterious!) Cheers!